I said I would write something everyday…and I’m trying….really I am. Last night we had a girls night, my daughter, my cousin and myself. A little wine, ok a lot of wine but that’s another topic…hot tub and face masks. Here is what was expected: absolutely Nothing! No important conversations. No stress. Exactly what we need sometimes….probably more often than we get it. But I guess that is life right? It’s the little escapes that keep us going…squeezed in where we can slip them. And whether its a few minutes, hours, day or days; its amazing how we feel after giving ourselves permission to let go. This is an old rant…No nothing happened today to bring it on I’m just sitting here lost in my own mind. Okay. So. I’ve always been a person of few words. I say what I mean and leave it at that. Why does it seem that people always expect, almost insist, that there should be some underlining meaning or something more that needs said? I’m not that complicated. Really I’m not. So yes I know that this has no relevant meaning to anything at this moment but I said I was going to write more and I didn’t have any idea what to write so…. here it is…. So. It is said that it takes 21 grueling days to create a new habit. Well it just so happens that there are a couple new habits I want to create. There are more but I think this is a good start. Eating Healthy…I’m doing more of my own cooking and trying to take my lunch to work with me. Writing…I not going to count yesterday so today will be day 1 for making a post of some kind. Saving for a house…I have a plan to have almost enough for a down payment in the bank by July….enough to start looking anyway with a hopeful move in date of this time next year. I guess that 3 out of 4 is a pretty good start. Right? Right? Maybe not but it is a start. Ok. So I’ve been living on the road for about a year and a half. Truth is that I both love and hate it. I’m loving the work I’m doing! I love learning my new trade! I love the guys that I work with and new friends that I’ve made! So now for the things that I don’t like – because you have to focus on the positives first right? I hate missing my family! I hate eating out every night (Yes I’m working on fixing this one)! I hate leaving home on Sunday night and not getting home till Friday night! So not much I can do about 2 out of 3 of my hates but the whole eating out every night thing has got to stop! For 2 reasons. 1 it’s expensive! and 2 it’s totally dragging me down! So what have I done to fix this ‘issue’ you ask? I’ve started amassing a small mobile kitchen for myself: hot plate, electric fry pan, a dinner place setting (plate and bowl), a few storage bowls, a small coffee pot. The bigger problem that I’m having is learning how to cook for just one person! You wouldn’t think this would be so hard but holy smokes! Everything and I mean EVERYTHING is created to feed as army! 😲😲😲😲😲 At least it seems that way. 😂😂 You want Rotisserie chicken – you know the one that comes hot from the store? You are going to get real tired of chicken over the next few days….and don’t forget some kind of side. Which is designed for a family of 4! So yes I went to the grocery store looking some kind of protein… and left with a whole chicken! Ok. So. Here it is. A good friend of mine talked me into applying for the local elevators union here in the Quad Cities. Actually the local hall is located in Des Moines, IA which is about 3 hours away from me. This is where I’ll have to go to take the test. And interview. And do any other testing/classes that I may need….. He apparently thinks I’m fearless…..
Ok. So. I did it….I’ve put in my application with transcripts and complete and total lack of experience. So now I’m sitting here going – OMG! What did I just get myself into?! They want me to take a test?! On that I haven’t done since I was a teenager (have I mentioned I’m 41)! Ok. So here are some truths about me…. I AM NOT FEARLESS! The whole idea of starting over (yet again) scares me spitless. A TEST? ON MECHANICAL S***?! OMG! Most of which I’ve never done and/or if I have it’s been 20+ years….. Yes I took my ASVAB and mechanical was my highest scoring section but that was 23 years ago! Quota? Smota! This just means I have to work harder to prove that I can do it (ok so I can handle that – I’ve been doing that most of my life lol) but it also means that walking in people think less of me. Ok. So. I guess I have some self-teaching to do. I need to bush up on some math…….Off to the library I go…. I know that Kiss Treatment was supposed to be about food but unfortunately I don’t have the time or money to post something about food constantly. So I’m going to change it up a bit. I will still post things about food but some posts are simply going to be ‘random thoughts’ that I have at any given time. For example – with Mother’s Day being just yesterday – I’ve been thinking about my relationships, with my mother and my children. So that’s what I’m going to write about today. My relationship with my mother has always been…..touchy….I think that’s probably the best word to describe it. I am the middle child and only girl. I know my mother loves me but there have been times that it wasn’t always easy to tell. The problem is that there are many ways that I know I am like my mother and ways that I am completely different. But that is a thought and discussion for another time and date I think. Although perhaps if you take some of my thoughts about my own kids and transfer them to my mom; I think you may understand my conclusions about my own mother. Now on to my thoughts about my own kids……. Have you ever been accused of loving or treating one child differently than another? I have many times. And if I am brutally honest with myself – it’s true. I do love my kids differently. That doesn’t mean I love one more or less than the other. They are different people with different needs and wants. There will be different expectations for each throughout their lives and I hope that I have prepared each for that. I hope that as they grow older that they are able to handle the challenges that life will throw at them with their head held high even when there are tears in their eyes. I’m not sure how clear my thoughts truly are but I will simply close with this simple thought. Each with the same fierceness yet each differently. Hi everyone! Sorry I’ve been absent for so long. 😦 Life has been a little crazy and add in ADD and somethings sadly get set aside. Or rather to be more honest I spaced and haven’t done any posts. But I’m still here and trying to figure out how to set my time management and do more posts. This weekend was Mr. Picky’s birthday weekend so what Mr. Picky wants Mr. Picky gets. 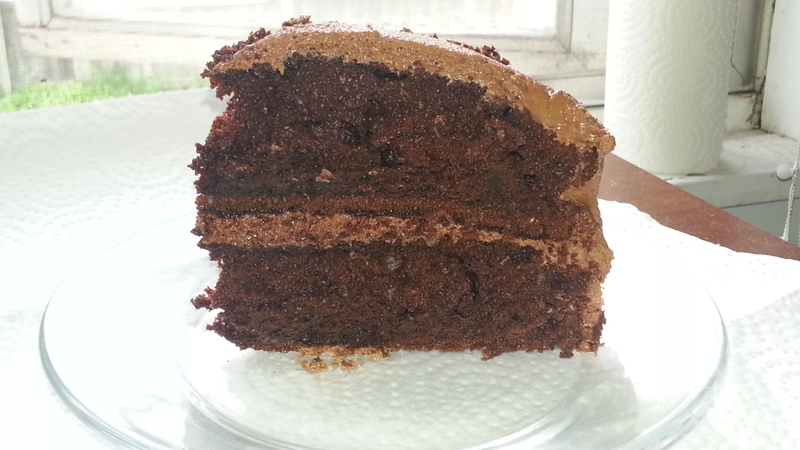 And he wanted Chocolate Cake with Chocolate frosting. Now for him a simple Devils Food cake out of the box would work just fine but I wanted to play and I got this great cookbook at a flea market a few weeks ago. Now the recipe says to make it in a Bundt pan but I used 2 – 9 in pans because I wanted a double layer cake. It also says to use the Chocolate Pan Frosting but again maverick that I am (um yeah ok LOL) I used my own Chocolate Butter-cream Frosting. Another side note – The recipe looks longer than it is difficult. 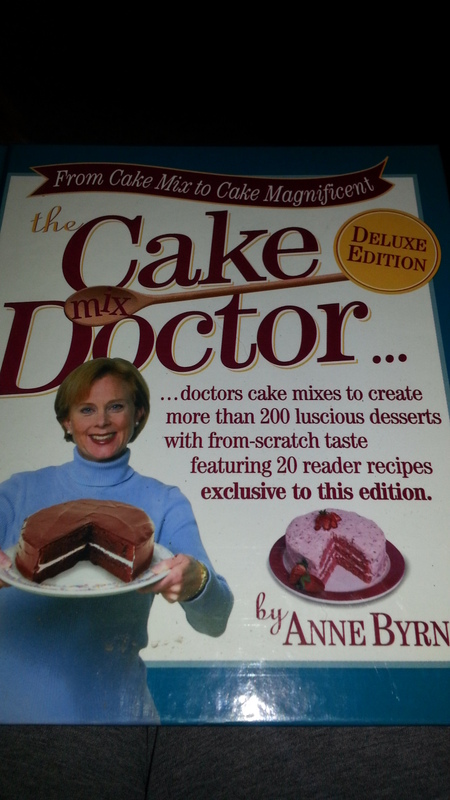 Ms. Anne Byrn definitely spells it out step by step so even the most inexperienced baker can make anything in her book. 1. Palace a rack in the canter or the oven and preheat the oven to 350°F. Lightly mist a 12 cup Bundt pan with Vegetable oil spray, then dust with flour (or use cake baking spray like I did). Shake out excess flour. Set the pan aside. 3. Place the cake mix, pudding, mix, eggs, buttermilk, oil, and Vanilla in a large mixing bowl. Fold in the melted chocolate. Blend with an electric mixer on low speed for 1 minute. Stop the machine and scrape down the sides of the bowl with a rubber spatula. Increase the mixer speed to medium and beat 2 to 3 more, scraping the sides down again if needed. The batter should look thick and well combined. Pour the batter into prepared pan, smoothing it out with the rubber spatula. Place the pan in the oven. 4. Bake the cake until it springs back when lightly pressed with your finger and just starts to pull away from the sides of the pan, 40 to 45 minutes. (Again I used 2 – 9 in pans and baking took about 30 minutes) Remove the pan from the oven and place it on a wire rack to cool for 20 minutes. Run a long sharp knife around the edge of the cake and invert it onto a rack to complete cooling, 20 minutes more. 5. Prepare frosting of your choice and frost. A side note if your in a hurry or simply don’t care for frosting you can simply sprinkle about 1/4 cup powdered sugar over the cake. In you mixer cream butter about 2 or 3 minutes. Add sugar SLOWLY, you may need to add a couple tablespoons water. Add the Coco Powder again SLOWLY, again a couple tablespoons water will be needed or it will be to thick. Add Vanilla and beat for a few minutes more to be sure it is fully incorporated. Don’t worry you really can’t over beat this frosting. I’m a sucker for cheesecake! 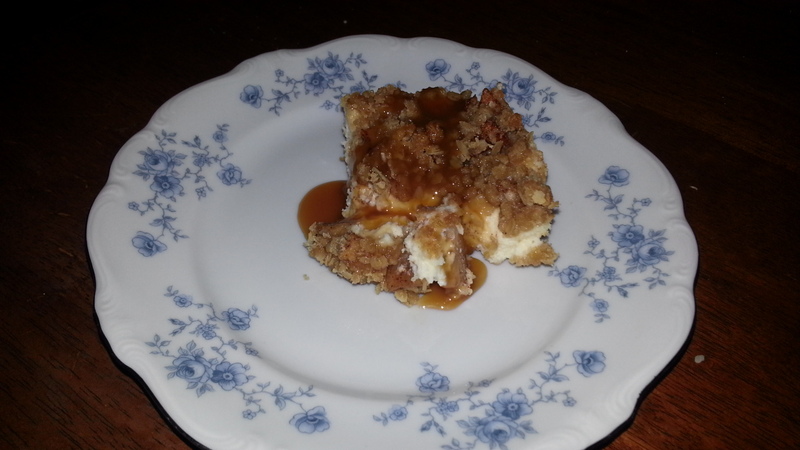 So when I came across this recipe for Caramel Apple Cheesecake on http://www.365daysofbakingandmore.com/2012/02/day-348-caramel-apple-cheesecake-bars-for-the-secret-recipe-club/ I knew I had to try it. And you know what it is absolutely wonderful! Preheat oven to 350 degrees F, and prepare an 8 X 8-inch baking dish by spraying it with cooking spray. In a small bowl, combine the ingredients for the crust: graham cracker crumbs, brown sugar, and melted butter, mixing well with a fork. Place crust mixture into prepared baking dish, pressing down gently with your fingers. In the bowl of an electric mixer fitted with the paddle attachment, beat the cream cheese until soft and smooth, about 2 minutes. Add the sugar, egg and vanilla and beat until smooth. Pour over crust, spreading evenly. In a medium bowl, combine ingredients for the apple layer: brown sugar, cinnamon, nutmeg and cloves. Mix well. Peel, core and dice the apple into small pieces. Add to dry ingredients and toss to coat. Distribute evenly over the cheesecake layer in the baking dish. In another medium bowl, combine ingredients for streusel topping: brown sugar, flour, oats, cinnamon, and melted butter. Mix will until a coarse meal is formed. Sprinkle evenly over apple layer. Bake for 30-40 minutes until streusel is golden. Transfer baking dish to a wire rack to cool to room temperature and then refrigerate for an hour or more to set. For the caramel drizzle, in a microwavable bowl, melt the caramels on increments of 30 seconds, until smooth, stirring in between. Allow to cool slightly and stir in the heavy cream. Drizzle with caramel sauce before serving. We are big lovers of spaghetti and lasagna in this house. Mom decided today that we should try our hand at stuffed shells. 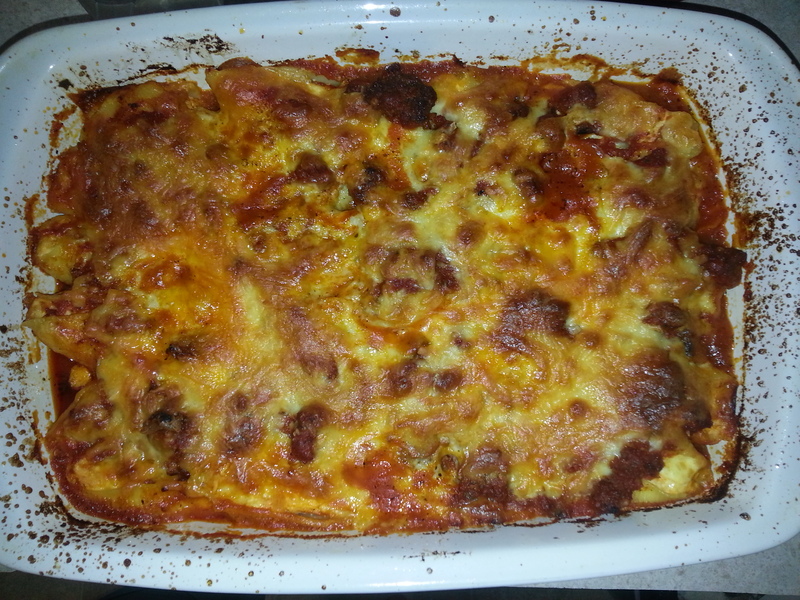 I figured it couldn’t be any more work that lasagna so why not? Turns out it was pretty easy and tasted great! Here is what we did. Brown sausage and hamburger and drain. Add to sauce and let simmer. 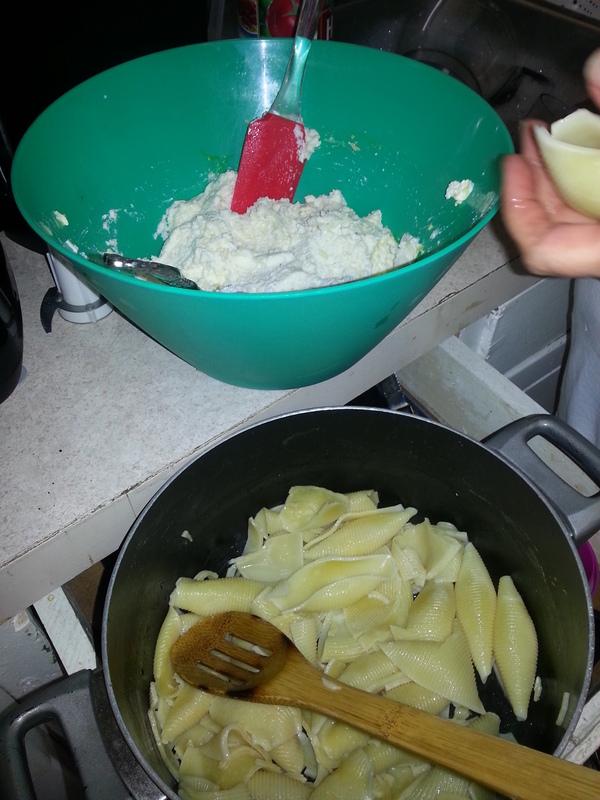 Once the pan is full, pour sauce over the shells, top with mozzarella cheese and cover with foil. Place in the oven set at 350 for 1 hour. Let stand for 10 min and enjoy! Place leftovers on foil and make serving size pouches to reheat in the oven for easy cooking nights!